Treasure hunting is a wiggly, giggly good time with Cranky the Octopus! To start the sea-venture, simply equip him with some Play-Doh compound and turn the crank to grow long, silly legs! Open the clamshell and treasure chests to reveal moulds that can make pearl rings and gold doubloons. 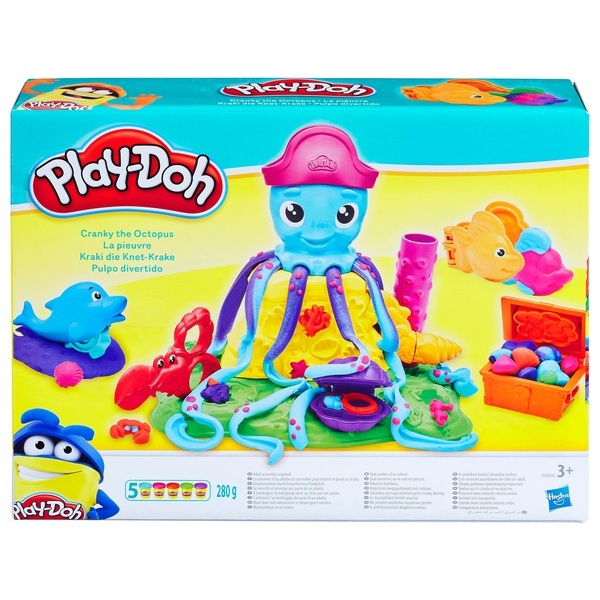 There are also lots of ocean friends and accessories for more imaginative fun. Shape a goldfish with the book- mould, slice through the tide with the dolphin cutter, and cut with the lobster scissors. For more imaginative fun, roll coral reef textures into Play-Doh compound with the roller and create fun ocean shapes with the half-moulds all around the playset! EU Warning: Not suitable for children under the age of 3 years due to small parts which could cause a choking hazard. Compound not intended to be eaten. Contains wheat.